Thanks for stopping by Gina's blog on this last day of 2014. 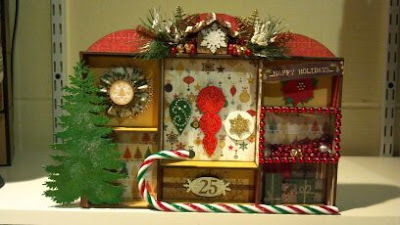 I have a happy holidays shadowbox for you today. I apologize for posting this after Christmas, but it was a gift! 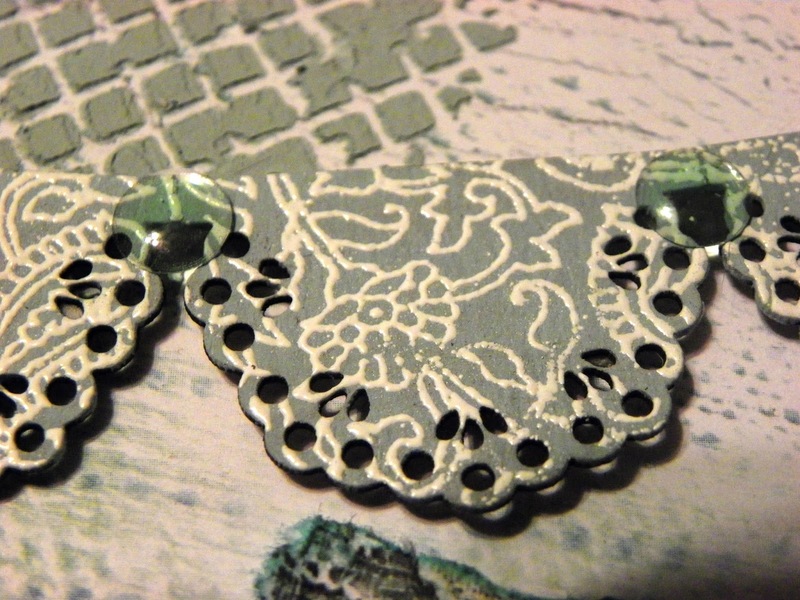 This element piece was made with one of Gina's doilies and a punchelement 1 inch scalloped. You can see the three different techniques I used on the ornaments. After they were painted I used bling on the first, a rubber stamp on the second, and one of Gina's snowflakes that I glittered on the third. The number 25 was custom made by Gina. From all of us a Gina's Designs, have a safe and Happy New Year! It's almost a new year! 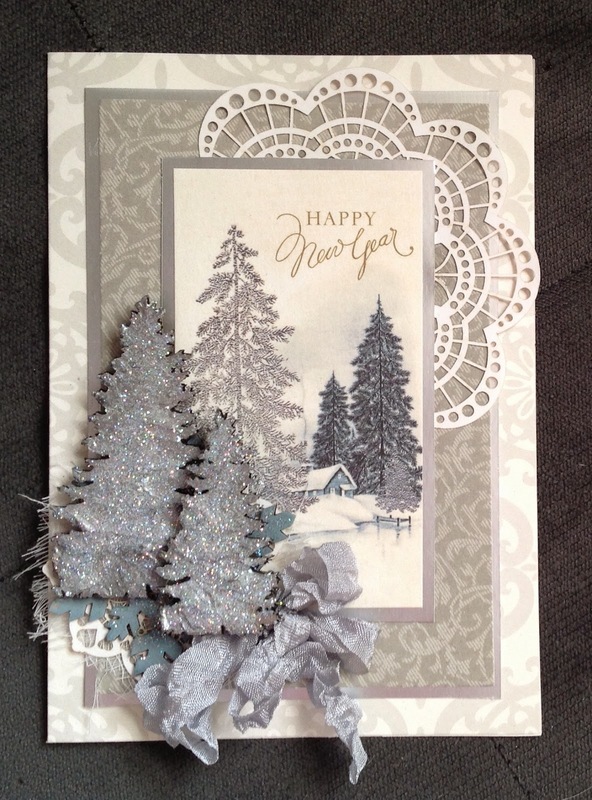 I made a few cards using Gina's chipboard shapes to send out in the new year! I thought this was a good idea for those of us that did not send out Christmas cards. For this first card I used some pine tree chipboard shapes and put a very thick layer of silver modeling cream and fine glitter. Under the trees, I used one of the snowflakes, from the snowflake shape set. I painted it a "weathered wood" color to match the barn, and placed an intricate doily underneath. I really had fun with this "Let It Snow" card! 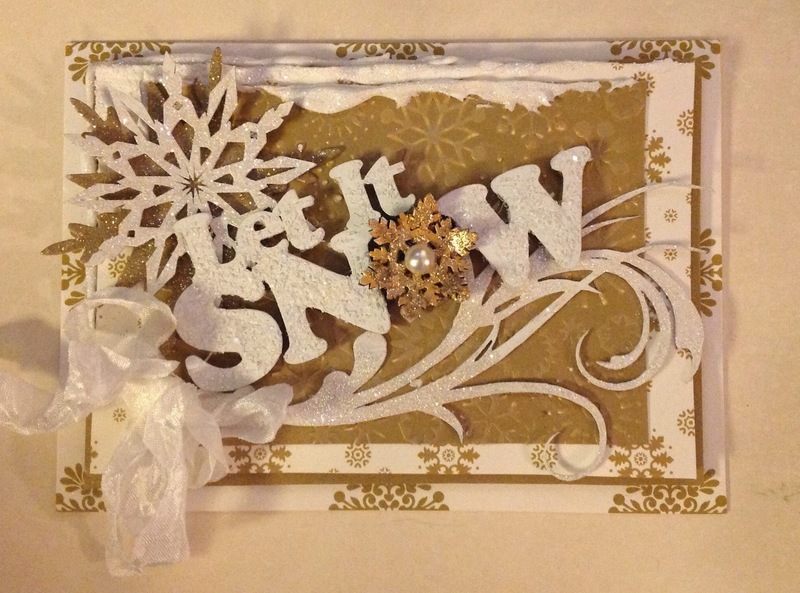 I used one of the large snowflakes and a beautiful flourish! Both have gesso, white paint, and fine glitter on them. For the title I used chunky glitter glass instead of glitter. The gold snowflake was covered with Inka gold, and then a small about of gold embossing powder was heat embossed.. I thought this was a pretty card idea for the winter. I love snow and cardinals! 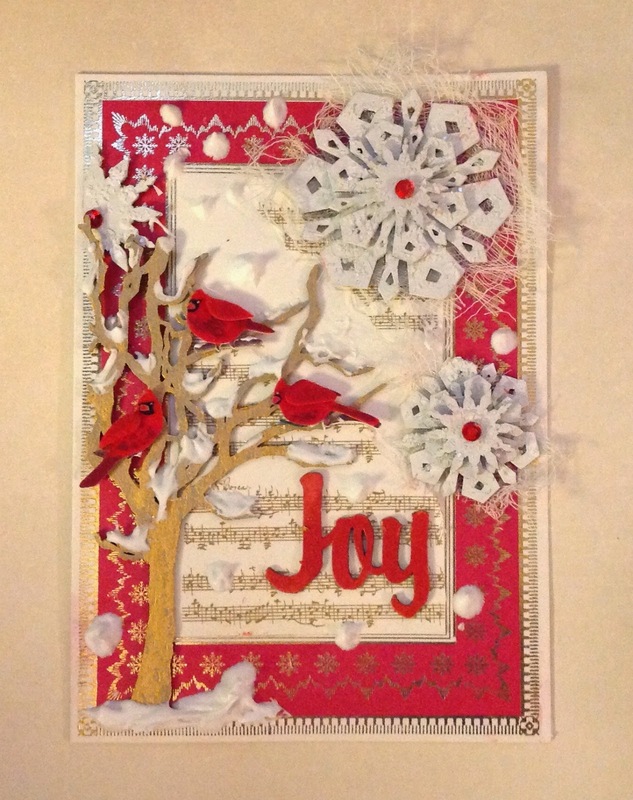 For this winter card, I used several of the snowflake shapes and stacked them. I painted each piece with white gesso, white paint, and sprinkled chunky glitter glass over each piece. I dabbed a bit of Inka gold on the tree. I wanted some of the natural chipboard to show through. 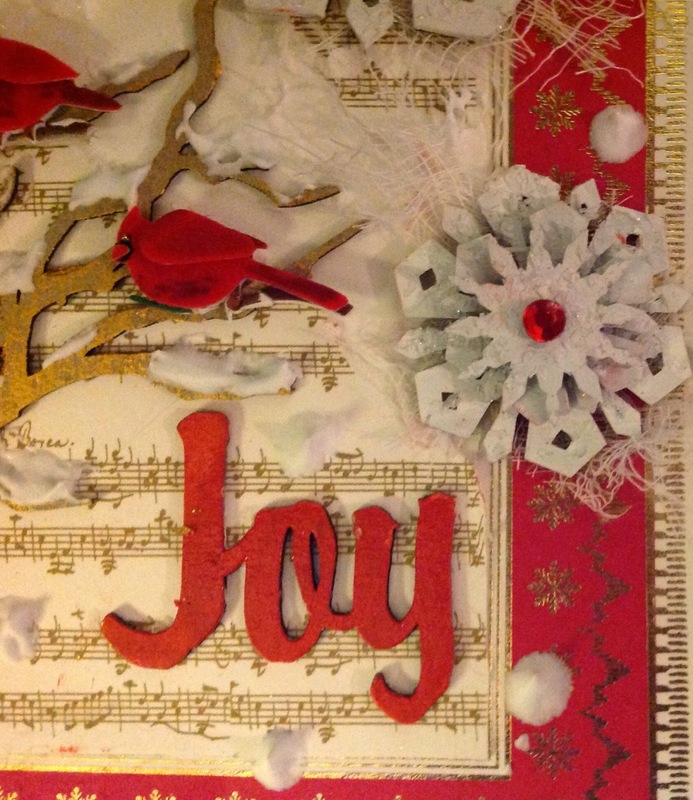 I used red brick chalk ink for the word Joy. Thank you for stopping by today and HAPPY NEW YEAR!!!!!! Good morning, Deann here with mitten-shaped gift tags. 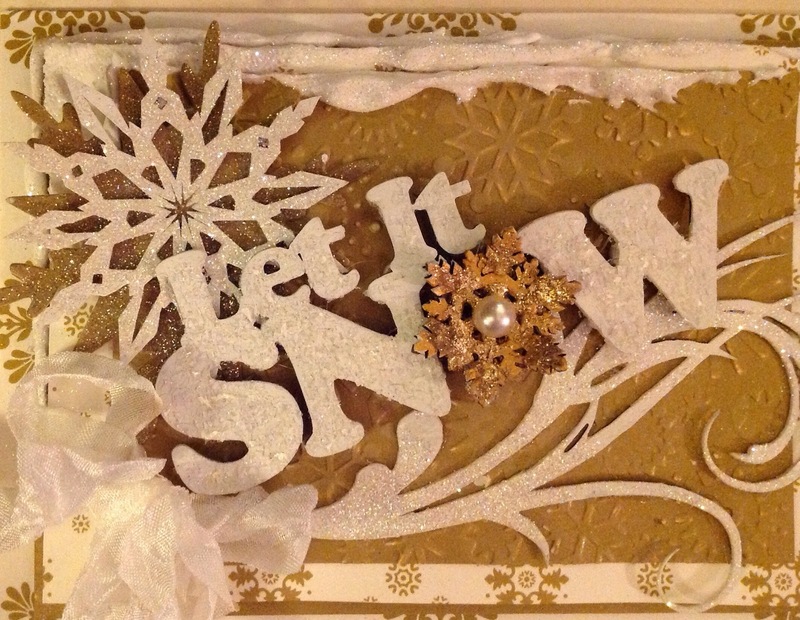 I used the Mitten Micro Mini Album and lots of snowflakes from the Snowflake Shape Set . The mittens were painted with acrylic paint in gold, blue and white. Once dry, I added all the goodies - layers of snowflakes, flowers, lace,ribbon and dollies. I added spacers between all of the snowflakes and inked the edges of the mitten with blue ink. For this mitten, I inked the edges with blue ink. I started the stack with a circle of striped paper, then a spacer,snowflake,spacer,circle of paper, candy cane and flowers. Hi! Lynne here with a beach-themed layout. I don't know about you, but I'm definitely ready for summer now that Christmas has passed! 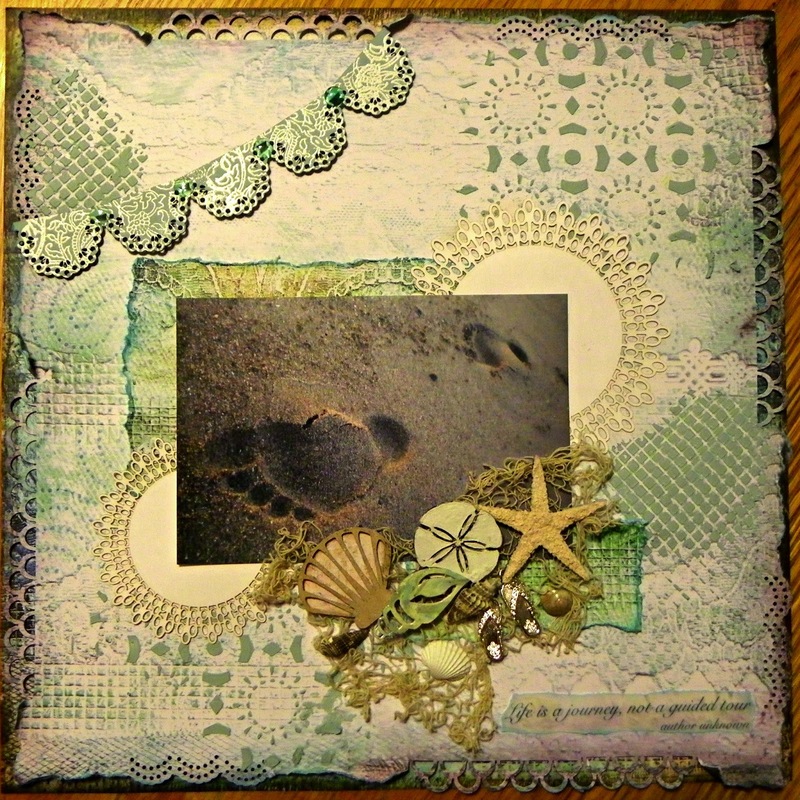 I had so much fun altering the chipboard pieces from the Beach Shape Set and the banner I chose from the Banner Border Strips set. 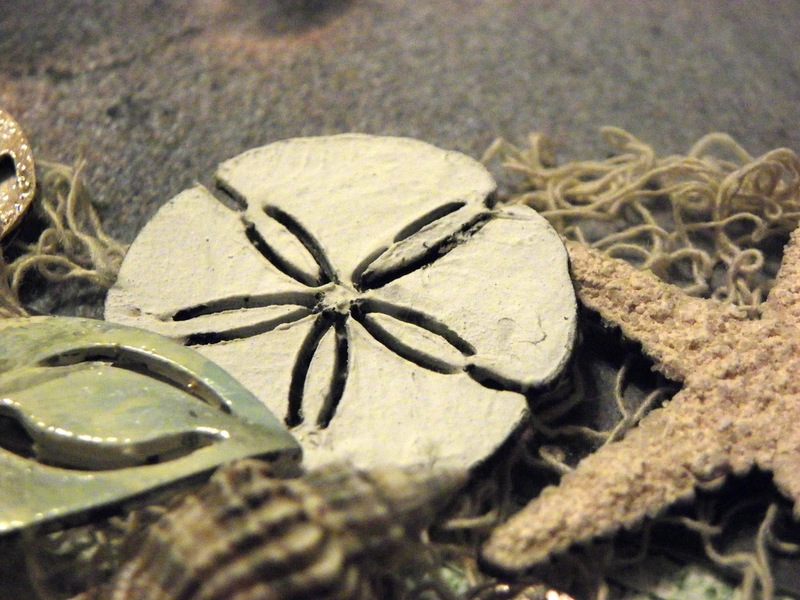 I used homemade texture paste (baby powder recipe) to give the sand dollar a realistic finish. 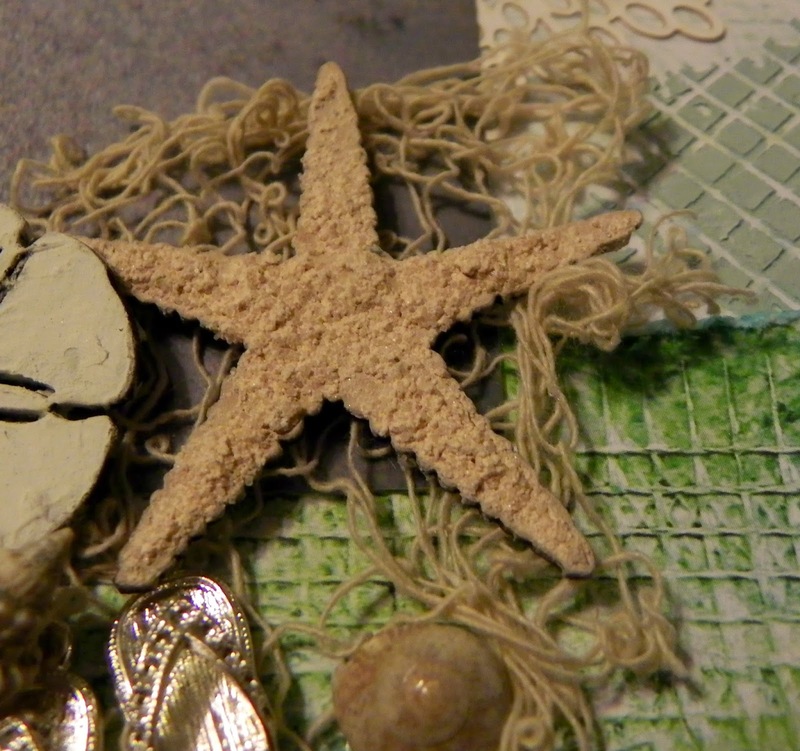 For the starfish, I mixed salt and acrylic paint to get the rough effect I wanted-love the way it came out! The banner was painted, then stamped with Versamark and heat-embossed to give a lacy effect to echo the patterns in the paper. Thanks so much for stopping by. I hope this summery page warms up those of you in chilly snowy spots at least a little. Hi Everyone! Debbie with you today sharing a mixed media canvas that was created with Gina's Designs chipboard and various sprays and rubs. The canvas is titled "Leave Room in Your Garden For The Faeries to Dance." 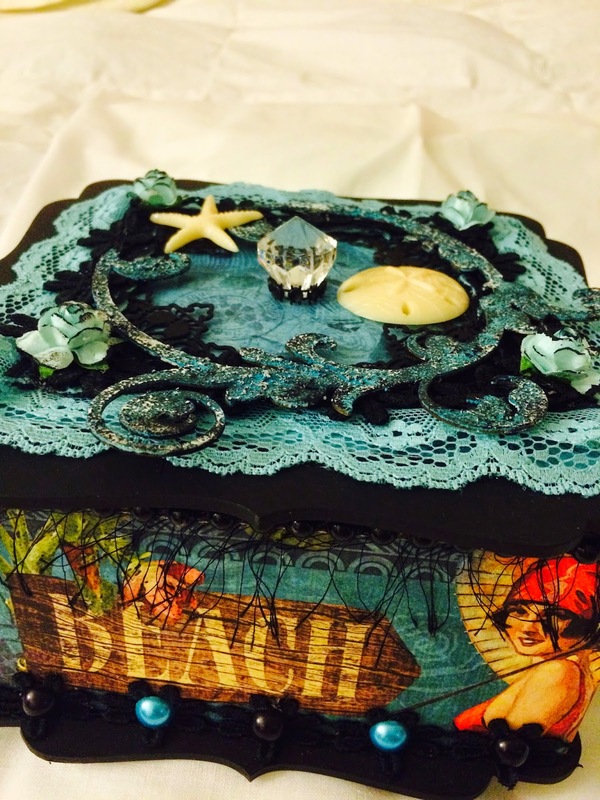 Thanks for stopping by Gina's Designs blog today! Hi everyone! Melissa here with three ATCs for Gina's Designs. 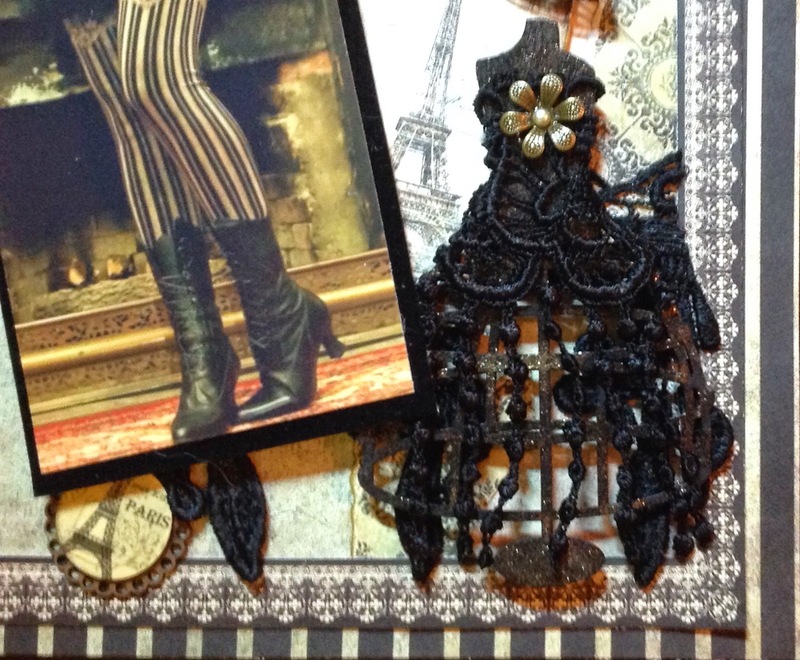 I think the delicacy of the chipboard and these little pictures fit together. To decorate the chipboard, I first prepped the chipboard with gesso,followed by blue chalk ink. When the top one was dry, I put on some Inka Gold. On the bottom two pieces I put on a layer of crackle, followed by Inka Gold. Labels: Layered Border -Victoria Small. Hello everyone. Shanna here today to share with you some fun cards I created fro Gina's Designs. I really have been saving (HOARDING) these papers waiting for a great time to use them. When I pulled out my chippies to play with, the first thing that popped into mind were these papers! The chipboard pieces that I added to the cards got a coat of gesso. Then I added some stickles. The tags I really enjoyed leaving a blank chipboard feel to. I did, however, ink the edges to give it a vintage edge! Both card were finished off with a bow, flowers, and a sentiment. Thank you so much for stopping by today. Make sure you keep coming back for more inspiration! Santa's Christmas delivery from a balloon with a steampunk twist. I took a 12 x 12 canvas and painted the sides and border a light brown. 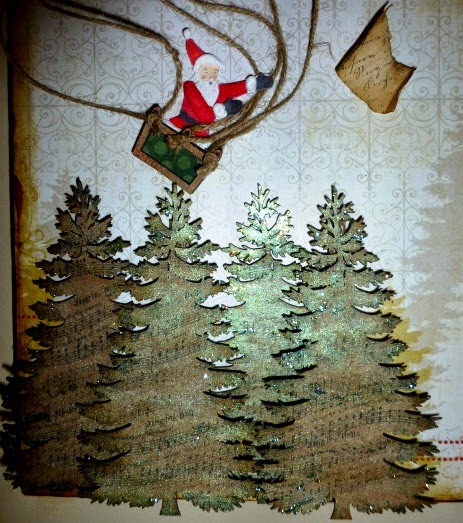 I used Mod Podge to seal the paint and adhere the Bo-Bunny: Silver and Gold - Festivities paper. The compass is from Gina's Designs and painted gold. It looked like it was printed on the paper so I raised it for dimension. 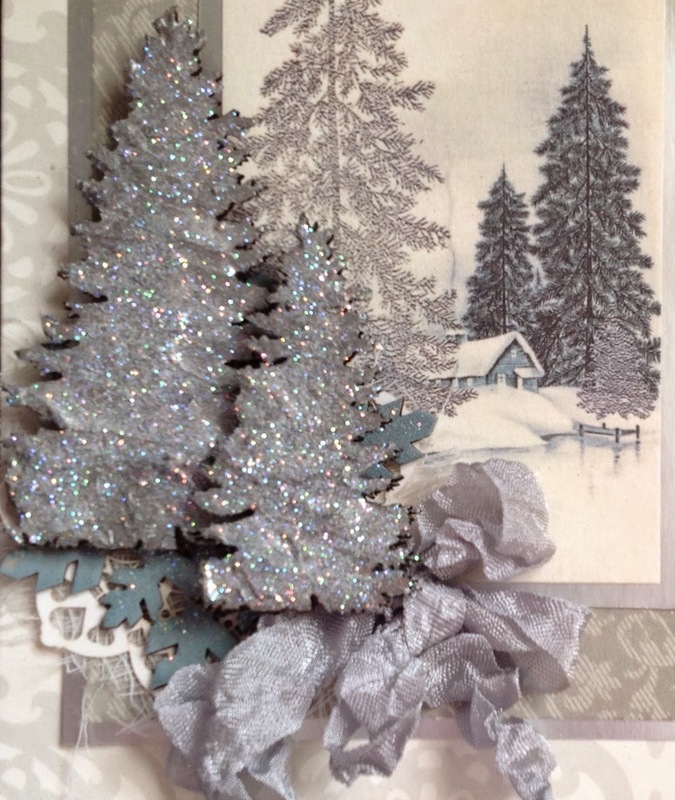 I used Sparkling H20's Crystal Green on the raw chipboard and got an iridescent effect on the trees. I stamped a jingle bells music stamp on the trees and finished the edges with Stickles - Pantina. 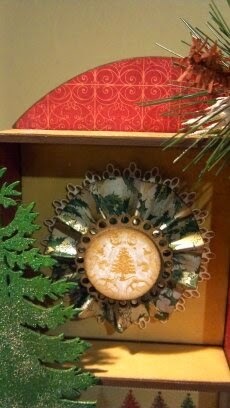 I placed chipboard under the trees at different thicknesses to create a 3D look. I hand drew Santa, colored him with Copic markers and used a snow writer on his coat and hat. The chipboard basket was colored with Sparkling H20's and Bo-Bunny paper. The list was an old stamp on tan paper and distressed with brown ink. 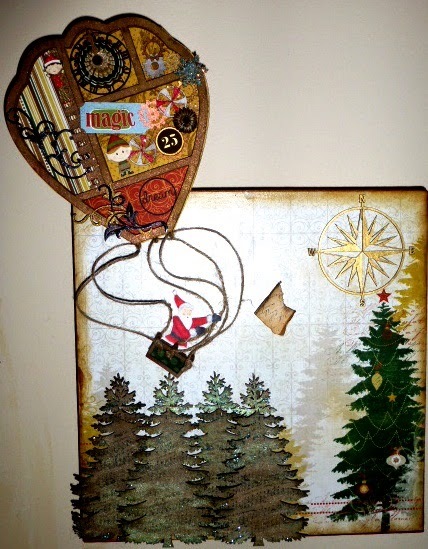 Gina's Designs Mini Display Tray -Hot Air Balloon tops the canvas on a cardboard "hinge". I used the Sparkling H20's on the outside of the balloon. Bo-Bunny - Silver and Gold paper line was used on the whole balloon. 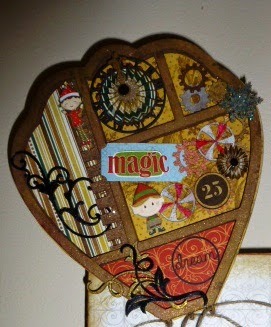 I used Tim Holtz rosette die by Sizzix under the clock face and hands, and a super small one was used as a gear. A fence from Gina's Beach Shape Set was cut down to make a ladder for the elf. Gina's gears were painted with silver, gold and bronze. The peppermint was painted white, red and distressed with brown ink to give it a gear look. 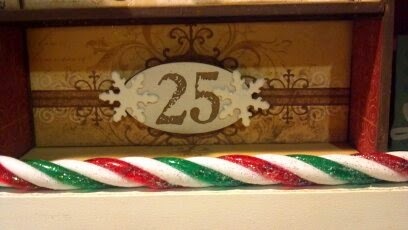 I used a Gina's Design Type Writer Key "25" as gear. The snowflake was daubed with Stickles - Icicle, Gold and Pantina. The Bo-Bunny - Elf Magic paper elves were fussy cut out and the magic ticket was punched out using an EK Success Punch. 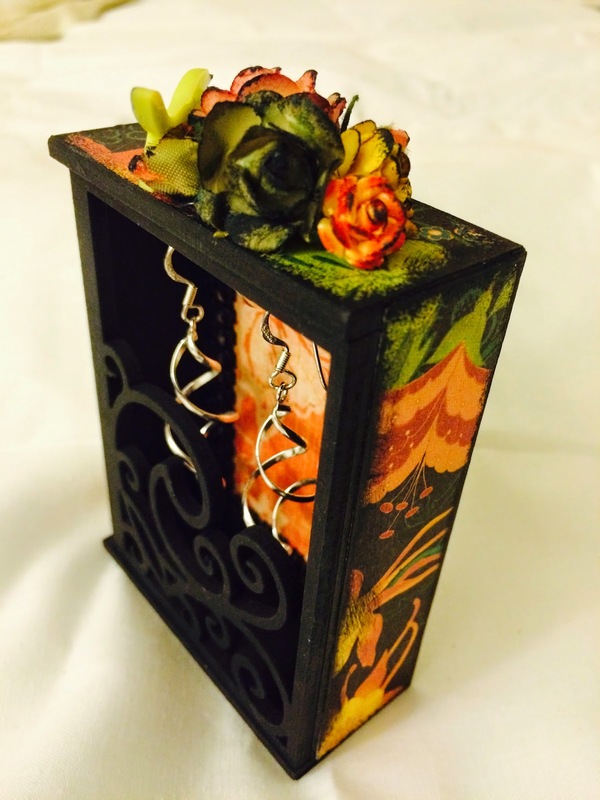 Gina's flourishes miniatures were painted black and gold. The dream in a circle is new for Gina's Design and will be available in the store in 2015! Merry Christmas from Gina and the entire design team. I decorated a six pane window with snow flakes, fake snow & Christmas greenery, with a few different flourish's from Gina's Designs. Layered Flourish with Christmas greenery. 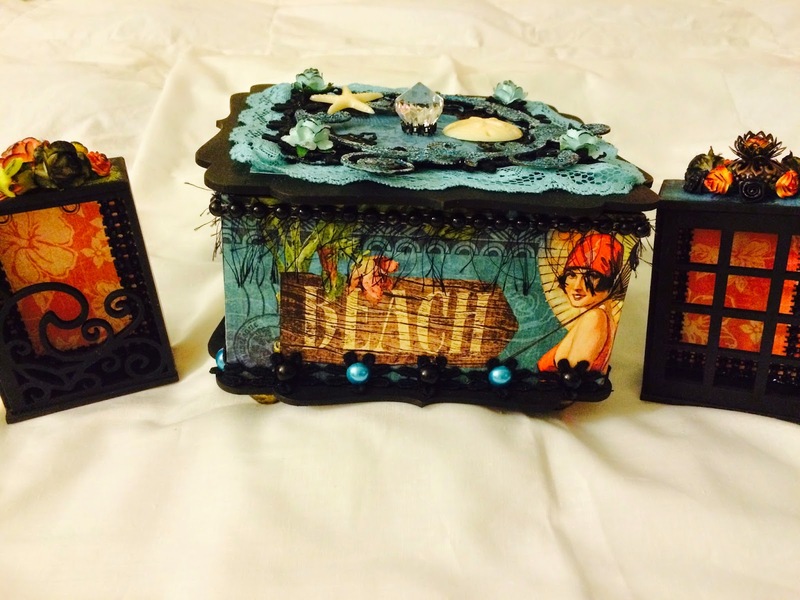 trinket/jewelry boxes in a summer/beach theme. and teal and a hint of white. two eye hooks inside each of the boxes. 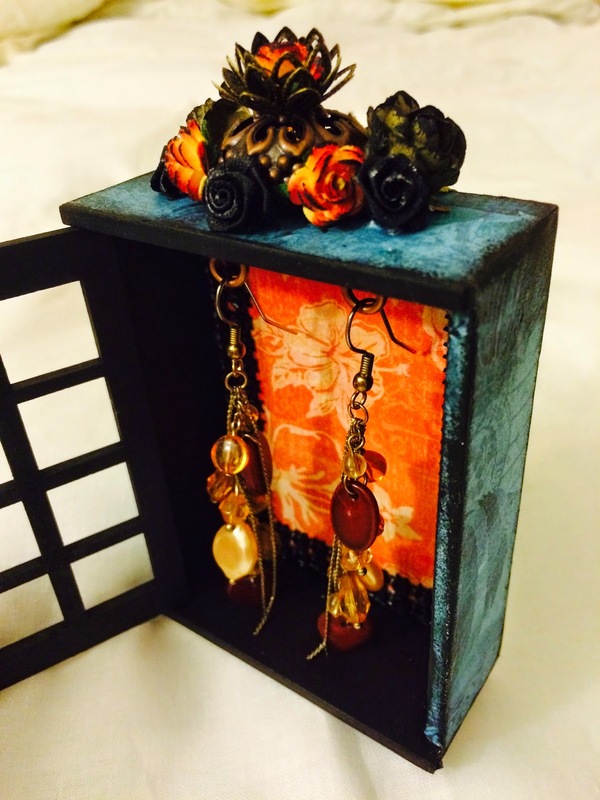 You are then able to hang your favorite earrings. Check out Gina's Designs to pick up all the items I used and more! hope you enjoyed my creations as much as I did making them! Now that we are on the other side of Christmas, its time to get reorganized and this amazing 24 drawer storage unit is one of the best ways to do it! 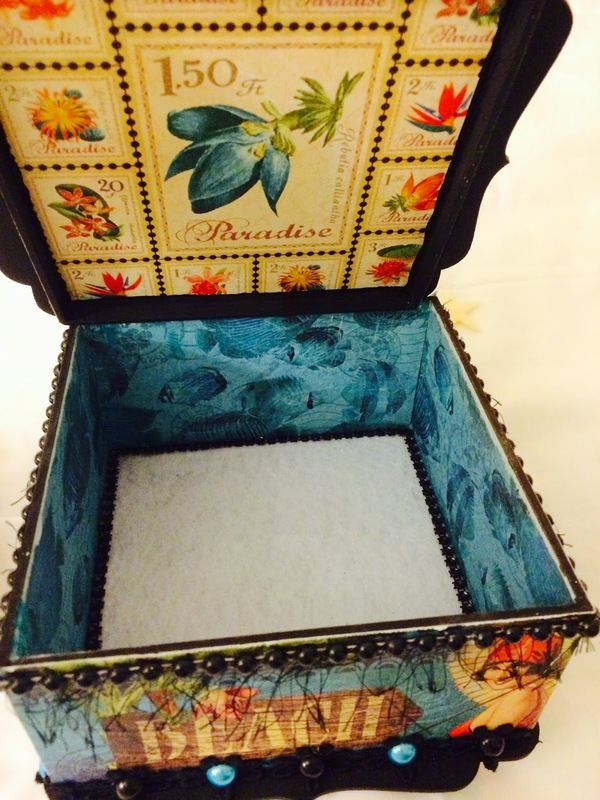 They are super easy to put together and take no time at all to decorate with your favorite paper and embellishments. I used Beacon 3 in 1 glue to put it together. My drawer unit will be in my craft room, so I needed some heavy duty handles on mine as I will be opening and closing the drawers often. I chose some nice paper in the color tones of my room to back the metal pieces. This is actually my second 24 drawer unit I have, it holds so much, and as my crafty space grows, so does my need for storage. The great thing about these storage units is that you can make it anyway you like it, it would be great to have in a powder room, or maybe make it into a jewelry box, or perhaps even to store dry herbs in your kitchen, the possibilities are endless! Gina has a wide selection of these storage units in various sizes, check out the store today to see what will work for your space! Happy Tuesday! 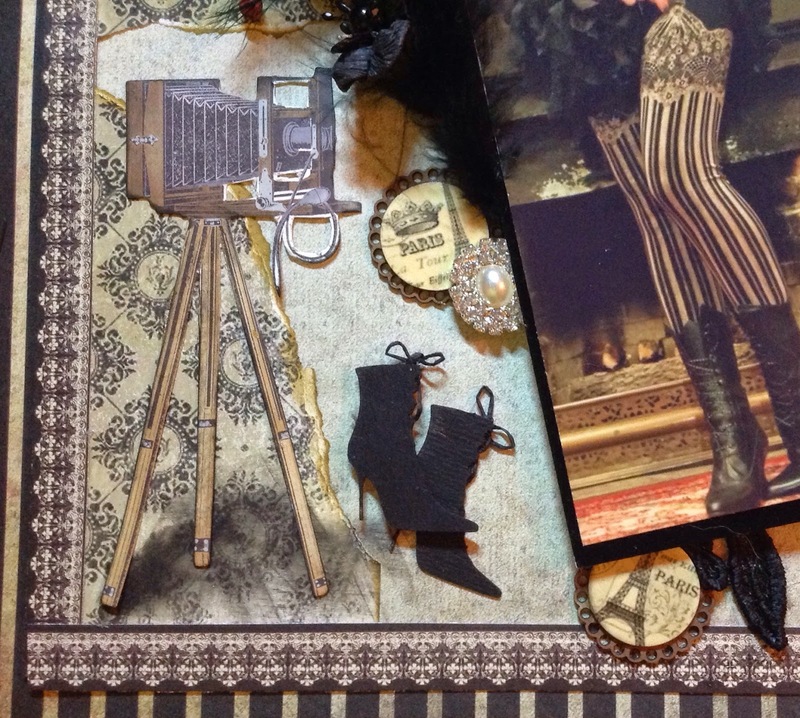 Today I'm sharing a vintage Parisian layout. 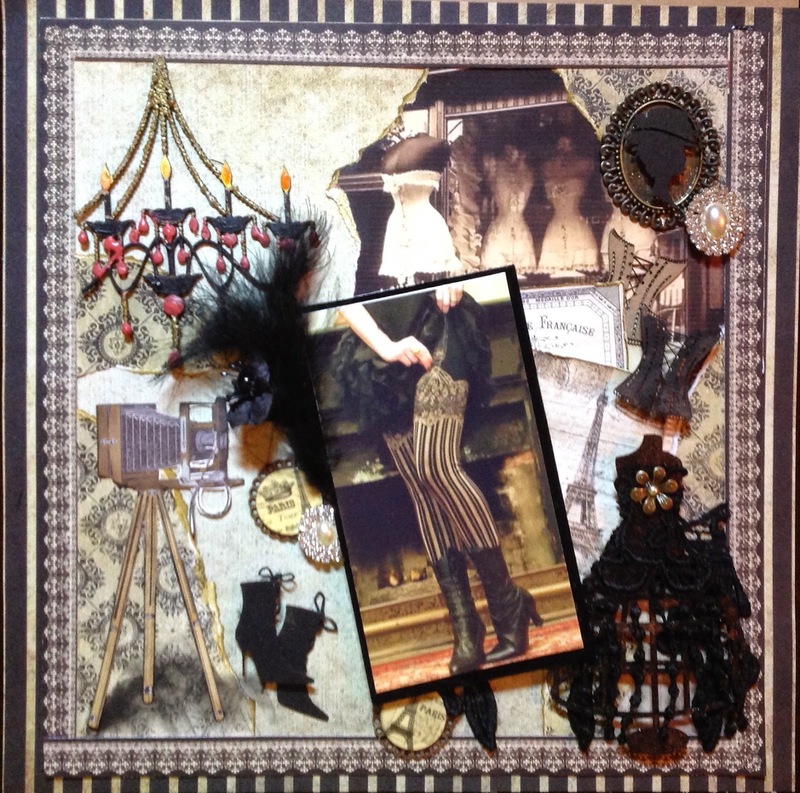 When I saw this photo of the stockings it made me think of Gina's Parisian Shape set. So many cute items! 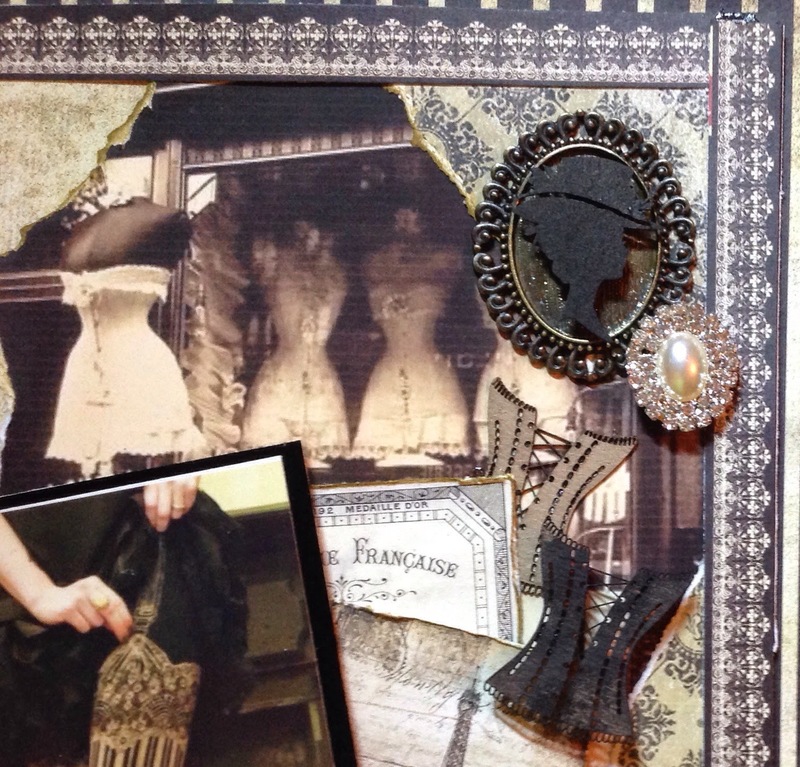 I used two of the corsets; one with black chalk ink, and left one natural. The darling woman in a hat silhouette is also covered in black chalk ink. I used the boots from the Miniatures Shape Set - Ladies Choice, colored them black and then added then laces. 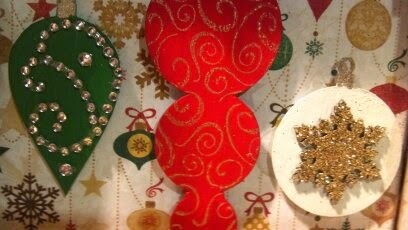 The round scalloped element pieces were created by our very own Gina! In the store you will find Punchelements 1 inch Scalloped to make you very own elements. On the dress form, I painted it with black chalk ink, and finished with a sheer gold mist.